Fiona’s introduction to cats was with a rescued Domestic kitten, which at 10 days old needed a helping hand and a lot of care. Mignon was joined by a handsome white Russian male in 1998. Odessa White Knight (Kimba) was her introduction to showing cats. 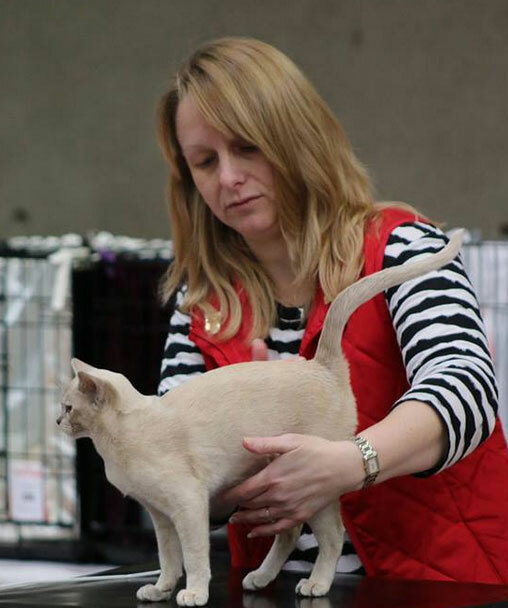 Since then Fiona has been involved with many facets of showing cats – first as a steward, then by completing the GCCFSA Group 3/4 Judges course, followed by Group 2 and currently working towards Group 1. Fiona enjoys the experiences that judging provides and seeing so many beautiful cats. Fiona started breeding Russians in 2000 under the prefix of ’Myenya’ with a lovely Odessa female and has gone on to have many successful exhibits on the show bench. Fiona was involved with the Foreign Shorthair Cat Club for 20 years and is now a member of the Adelaide Cat Club, and the Governing Council of the Cat Fancy of SA. Currently serving as a delegate for Adelaide Cat Club and as Secretary of GCCFSA.